The L.A.-based startup nProgress is launching a new social discovery app ntro this morning, backed by over $1.7 million in funding from Jarl Mohn, Gordon Crawford, Kevin Wall, Activation Media Partners, Baroda Ventures, SV Angel, Jeff Pulver and Richard Crowell. The app, available now for iPhone and Android, is meant to connect you with others around who you may know through mutual friends or with those who share a common interest. But unlike the others in this space (and there are plenty), ntro is staging its rollout to its target markets. It launches today in L.A. and the San Francisco Bay area, with additional cities planned for the future. Ntro is offering an interesting combination of features we’ve previously seen in other “social discovery” apps, like Sonar, Banjo, Mingle and Holler, to name just a few. 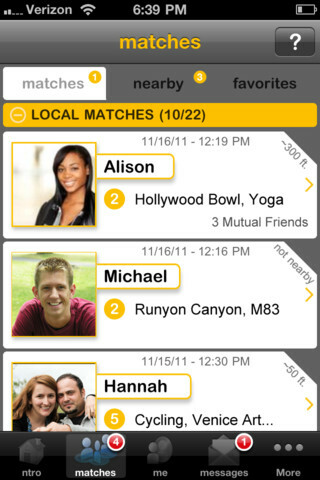 Like Sonar, ntro highlights those nearby you may know through mutual friends. Like Holler, it connects people around interests. Like Mingle, it’s focused on making introductions. And like Banjo, it does it all automatically. Where ntro may have a bit of an edge, at least for now, is in terms of the customizations it provides. There are extensive filters and controls offered, allowing you to set your top interests as well as filter and search the surrounding crowd by very narrow interests. That is, not just “music” or “rock music” but the name of a favorite band, for example. There’s also a heavy focus on privacy – the app never shares your location, nor does it share your personal info (like your phone number, email or even last name) without your consent. With these extensive protections in place, there’s a bit of distance between you and those around you, which is quite unlike the creepy/awesomeness that is the social stalkerish Banjo or Sonar. In testing ntro, I couldn’t even see users’ profile photos, which is either due to the photo approval process (there’s a delay) or users’ own choice to not show their face (that’s an option). But if you really think you’ve found your soulmate/business connection/new best friend based on interests, you can message them via the app. The other standout feature from ntro is the cover flow-esque way you browse through interests, where every item, whether a band, a book, a sport, an activity, etc., is given its own thumbnail. You then just tap the thumbnail to who else likes that item and is nearby. At present, anyone can download the app and poke around, but only those in L.A. and S.F. will find nearby matches. The focus for the rollout is on large metro areas, with the next cities planned being New York, Chicago, D.C. and Boston. You can try the app now via the download iTunes or the Android Market.